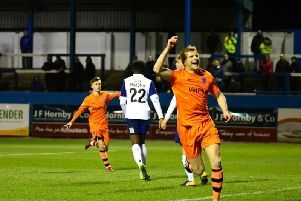 FC Halifax Town made it four wins out of five as they beat Dagenham and Redbridge 2-1 at The Shay. It was a hard-fought win for Town against a plucky Dagenham side, with Jonathan Edwards notching the winner after Matty Kosylo’s first-half opener was quickly cancelled out by Tomi Adeloye. Town always looked like they could score, and should have scored more, when they went forward, with their four attacking players interchanging well and carrying a threat. The hosts didn’t control the contest like they did last time out at home against Maidstone, and as a result, made hard work of it at times. The Shaymen are still a work in progress, which is to be expected five games in, but 12 points from a possible 15 represents an excellent start by anyone’s standards. Like all the talk had been during the week, all eyes were on Simon Lenighan, who started after his move to The Shay prompted an angry reaction from some supporters, which in turn prompted a statement from the club defending their signing. Quite a week. Almost enough to make you forget there was a football match at the end of it. Town flew out of the blocks, creating two clear chances inside the first five minutes, but Dayle Southwell’s shot one-on-one was saved by Elliott Justham, and then Niall Maher’s header was cleared off the line. By the time Kosylo eventually opened the scoring after half-an-hour, cutting in right-footed and firing in to the near post after Ryan Sellers’ long pass, Town had earned it with some creative forward play, especially by the impressive Southwell, who regularly found pockets of space in which to dictate attacks and drive forward. But Dagenham’s equaliser burst Halifax’s bubble. The visitors had come close, albeit sporadically, when Alex McQueen’s free-kick was tipped round the post by Sam Johnson, and Chike Kandi’s curling shot was deflected just wide. But their equaliser came after hesitant defending, with The Shaymen not taking their chance to clear the ball, and Adeloye poked it in from eight yards. Dagenham seemed to grow in confidence after that. There were fewer stray passes and nervy moments, and more attacks and pressure on the Town goal. Adeloye went close shortly after the restart, but his header was tipped wide of the top corner by Johnson. But Town regained the lead after building up a head of steam when Edwards’ flick goalwards from a whipped free-kick was brilliantly kept out by Elliott Justham, and then Maher’s shot was deflected over. Nathan Clarke then met Ben Tomlinson’s corner with a bullet header, and Edwards got a touch to take it in. This time, Town looked more controlled after scoring, and looked after their lead better having restored it. There was still work to be done to preserve it though, with Halifax never comfortable until the final whistle as Dagenham pushed for another equaliser. Halifax: Johnson, Hanson, Clarke, Brown, Sellers, Lenighan, Maher, Tomlinson, Southwell (King 90), Kosylo (Odelusi 89), Edwards (Preston 84). Subs not used: Rowley, McLeod. Dagenham: Justham, Gordon, Robinson, Davey, Pennell (Hoyte 75), Wright, McQueen, Goodliffe, Adeloye, Reynolds (Leighton 84), Kandi (Romain 63). Subs not used: Moore, Bonds.